Targets are the individuals being reviewed in the 360 process. They can be uploaded in mass or added to each project individually. Targets can be imported from an excel spreadsheet. There will be one column for first name, one for last name, and email address. 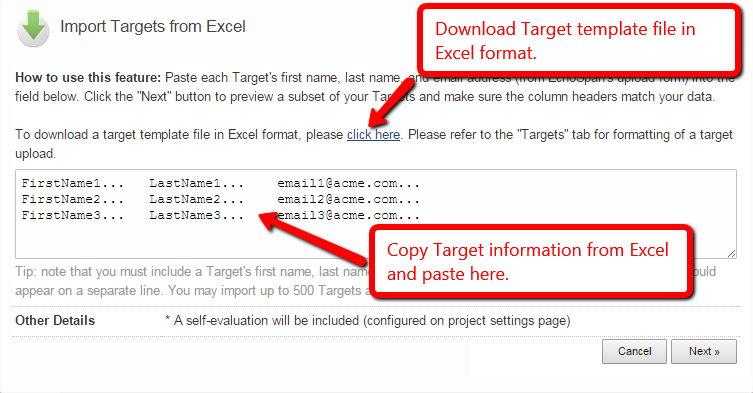 From the drop-down menu, select Targets >> Import From Excel. Copy and paste in your excel data. Click the "next" button and confirm that your import fields are correct. Last, click "Finish" to import your list. Targets can be added to a project one at a time. Click the Home menu option. You will find a box labeled "Add a New Target" on the bottom right side of the page. Enter the Target's first name, last name, and email address.